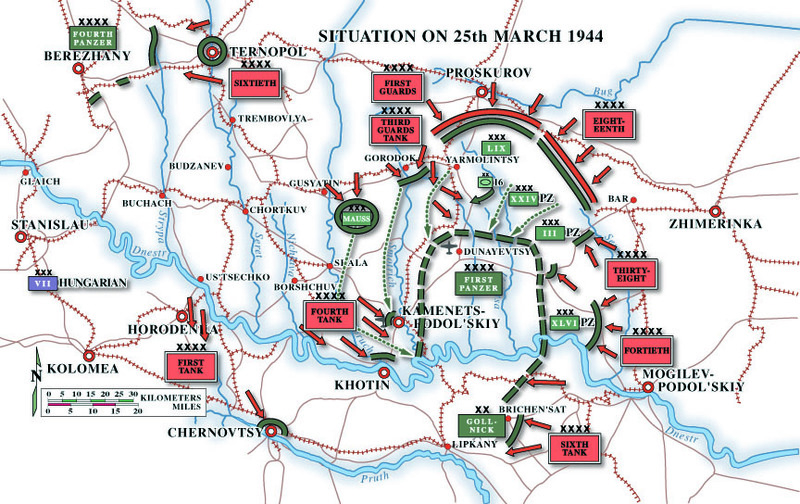 Kesselschlacht (literally, "cauldron battle") is a simulation depicting the encirclement and escape of the German First Panzer Army from the Ukraine in the Spring of 1944. The German forces were very low on fuel and ammunition and had been caught flat-footed by yet another overwhelming Soviet offensive. First Panzer Army had been cut-off by a total of nine Soviet armies. The breakout began on March 25, 1944, and continued into early April. In these two weeks, the Germans continuously conducted a mobile defense as their pocket drove westward in an effort to meet a relief force (which was spearheaded by the II SS Panzer Corps) attacking eastward. Supplied by air much of the time, First Panzer Army deceived the Soviet forces by moving west, instead of south as the Soviet generals had anticipated. The pocket crossed several swollen rivers, and struggled through thick mud and deep snow, yet somehow remained intact. 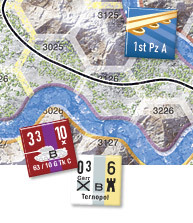 Unlike the Korsun Pocket disaster the month before, this time the Germans avoided yet another debacle. The commander of the First Panzer Army, Generaloberst Hans Hube, through his skillful leadership, proved to be a master of mobile defensive warfare. Like the topic, designer, or types of challenges in this game? See more Kesselschlacht game graphics (big download). Click here to view the contents spread below (in PDF format) for this issue of Against the Odds Magazine! Requires Adobe Acrobat Reader version 5 or later. Free download here. 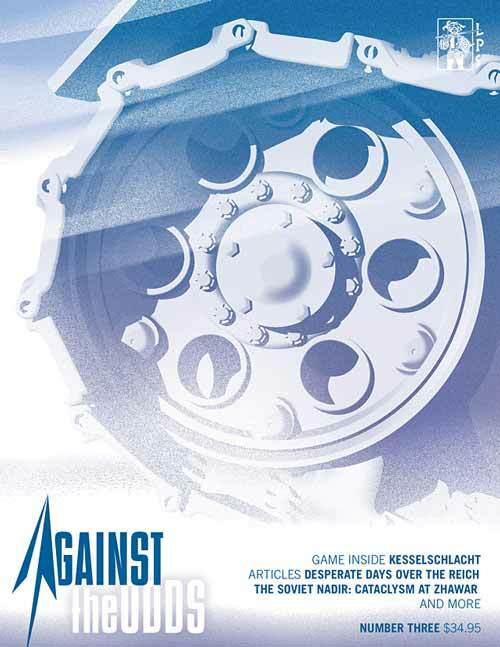 Download the Kesselschlacht rulebook (in PDF format). Read more about this game on Consimworld.